This painting joins two of the most famous balcony scenes since Romeo and Juliet. 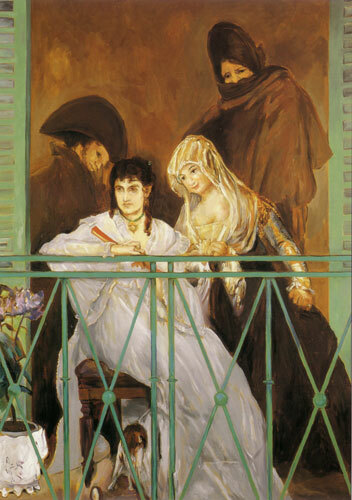 Goya's Majas on a Balcony, with two women of uncertain virtue leaning on a railing and two mysterious men lurking behind, must have hovered in Manet's imagination when he painted his own The Balcony almost sixty years later. Both paintings haunted me, so I replaced three background figures in Manet's painting with three fugitives from Goya's work, who now join Manet's friend and sister-in-law, the artist Berthe Morisot. This painting represents for me the way that artists, to varying degrees, contend with, or live happily with, the phantoms of their great predecessors.